We went to “Thai Taste” for lunch the other day. On the table were several bottles of different sauces. One soy, a hot fiery red sauce and this green sauce. It was simply delicious. We bought a pint of it to bring home, not only to enjoy over several meals, but to figure out just what is in this Thai Style Green Sauce so I could make it. Spooning the sauce over rice gave a clear distinctive flavor of all the ingredients. The woman at the restaurant looked quite nervous when I asked her what was in the sauce. “Just jalapeno and vinegar” she said. Right, I thought, she doesn’t want to revel her recipe. Something that really bothers me about some cooks is how they “hoard’ their recipes, keeping them secret as if they were some precious commodity. Taking a well-loved recipe to the grave is shameful and is not viewed in a good light, in my eyes anyway. What is the purpose of keeping recipes for well-loved dishes secret? Is it a control issue? A fear issue? I knew someone once who said they are glad to share recipes but they always leave a key ingredient out. Why? So that someone else wouldn’t make the dish as good as they can. So what if someone makes the green sauce at home? I will still come eat at your restaurant. I’m not coming for your green sauce, I am coming for the other things you offer on the menu. So here is my recipe for Thai Style Green Sauce. Make it and share. Tell the entire world how to make it, everyone should know. There are no quantities here, just ingredients. Make a small amount, use it and make more. Place all the herbs, garlic and ginger into a blender. Add enough rice wine vinegar to cover. Add a generous splash of fish sauce and blend for 2-3 minutes to get it all blended together. Taste and adjust flavors by adding more fish sauce or more vinegar. I served this on cedar planked salmon for dinner. Use the sauce on noodles, over rice, on grilled meats and seafood. It is very versatile and has many uses. 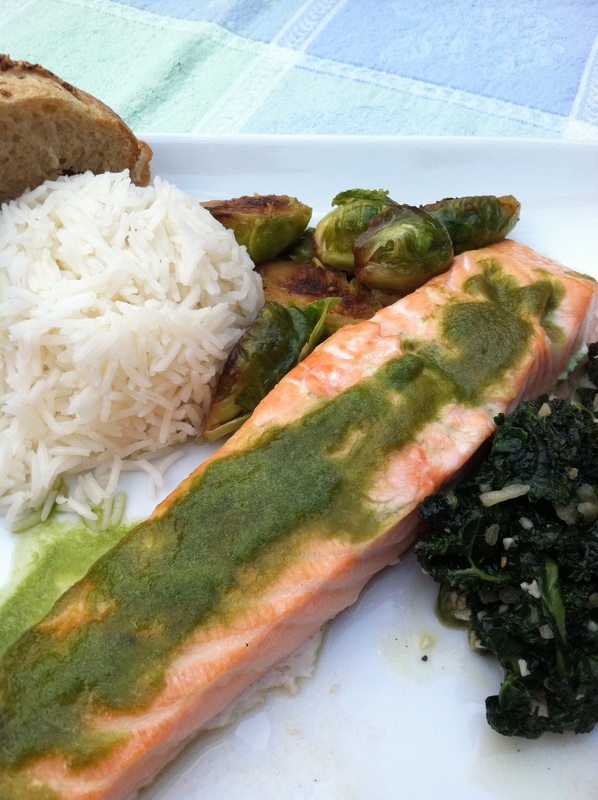 How do you use Thai Style Green sauce? This entry was posted in Recipes and tagged bunch cilantro, Coriander, Fish sauce, Green sauce, onion chives, Recipe, Rice, rice wine vinegar, Sauce, Vinegar. Bookmark the permalink. It is delicious and the photos make it even tastier! that was a real rant. I like it! had a similar experience recently with some multigrain flatbread a salad restaurant was making. at first they hid the recipe from me… annoying. 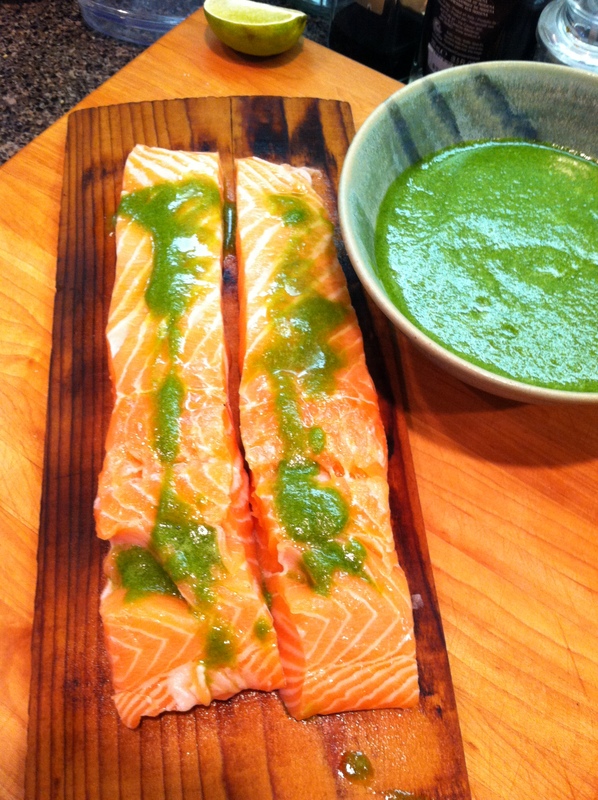 love your green sauce and I think I am going to copy it super-soon. I am trying to have as many green things as possible on my plate lately, check out my blog for a more in-depth update. If you want to go vegan, leave the fish sauce out but you may need to adjust for salt. Maybe I should let some rants loose, I’ve been holding back . . Thanks! It is quite yummy. Let me know how you like it and how you use it! Hi … this recipe sounds wonderful … I have to try it! Thanks so much for linking back to my blog! You are welcome. Thanks for stopping by here too.